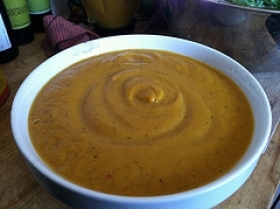 Have you made Butternut Squash Soup Portuguese Style? 1. Pour the olive oil into a large soup pot and saute the onions and garlic over low heat for 3-5 minutes. 2. Turn off the heat, cover the pot and let the onion-garlic mixture steam for 15 minutes. 3. Add the squash, potato and carrot and stir the mixture well. 4. Pour in the stock and bring the soup to a boil. 5. 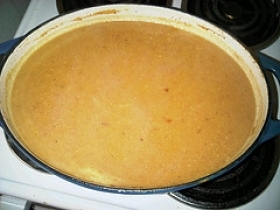 Reduce the heat, cover the pot, and let it simmer for 45 minutes. 6. Add the seasoning and parsley, stir well, cover the pot , and continue simmering for another 15 minutes. 7. 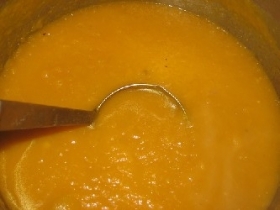 Blend one third of the soup at a time in a blender or food processor and return it to the original, but clean, pot. 8. 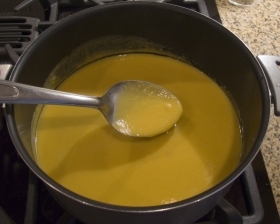 Reheat the soup over low heat, but do not let it come to a boil. 9. Serve hot and sprinkle fresh thyme leaves on top of each serving as garnish. 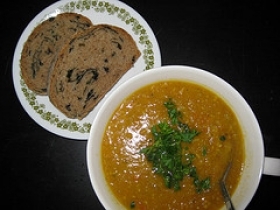 This recipe is high in Vitamin A with 332% of your daily recommended intake per serving. This recipe is high in Vitamin C with 49% of your daily recommended intake per serving. This recipe is a good source of Vitamin E with 13% of your daily recommended intake per serving. 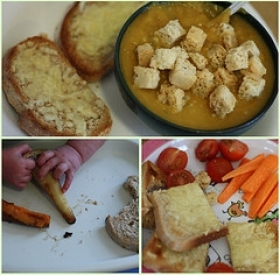 This recipe contains potential food allergens and will effect people with MSG, Potato, Poultry, Garlic, Onion, Olive Oil allergies.